Johann Friedrich von Brandt was the first to describe the Hispaniolan solenodon in 1833. There are only two surviving native Hispaniolan terrestrial mammals known, S. paradoxus being one of them. The other is known as the Hispaniolan hutia and resembles a small rat. S. paradoxus is found in both Haiti and the Dominican Republic. However, fossil evidence has suggested that solenodon-like creatures existed in North America about 30 million years ago but likely only survived on two Caribbean islands because of the scarcity of predators that reside there. Another reason they could have survived on these islands is because they are distributed throughout fairly well and are found in various habitats. This map includes the range in which S. paradoxus resides in Hispaniola. The red color shows the most inhabitants. As you can see, it is most prevalent in the northern region of the Dominican Republic and has declined drastically in Haiti. S. paradoxus can be found in lowland dry forests, as well as highland pine forests. It is often found in bushy, wooded areas near agriculturally developed land. S. paradoxus is nocturnal and often hides and sleeps during the day in burrows or hollows that they have constructed. It also finds shelter in caves, trees, hollowed logs, and small crevices in or under rocks. Another nocturnal animal is Agalychnis callidryas, more commonly known as the Red eyed tree frog. The Hispaniolan solenodon is on the verge of extinction due to several factors, the two most influential being the arrival of imported predators and killing by humans. Predators that were imported on the island are rats, dogs, cats, mongoose, and other animals. A plan for recovery of the population has been created but has yet to be put in action. 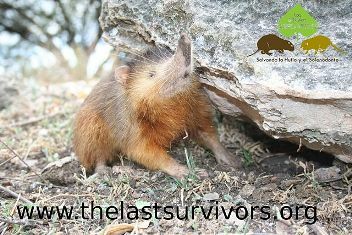 A project called The Last Survivors Project was started in 2009 to begin the long-term conservation of the Hispaniolan solenodon. This was to be done through an island-wide monitoring program, improved awareness, and participatory species action planning.